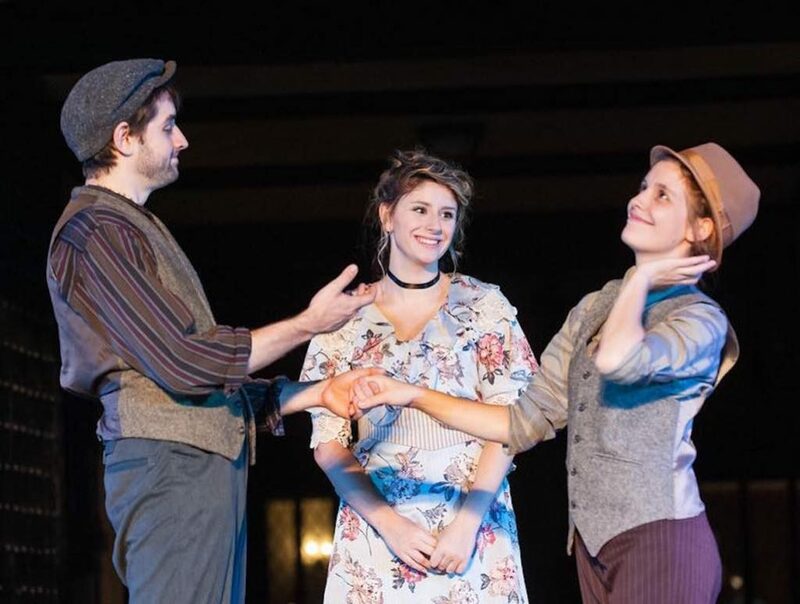 After torrential downpours cut a Friday performance short, Agecroft Hall witnessed some nearly perfect weather on Saturday and Sunday during its performances of Quill Theatre’s second summer production, As You Like It. A classic romantic comedy of the Bard, As You Like It offers a commentary on the rigidity of gender and love through the mode of cross dressing (a common sight in the world of Shakespeare). Director James Ricks had the difficult task of translating Shakespeare’s complicated wordplay and high-brow jokes that frequent this specific play. With a cast of both physical and oratory comedians, many of the jokes landed well, even through the barrage of Shakespeare’s language. At the helm, CJ Bergin embodies a goofy yet affable Orlando who is forced to flee from his violent older brother Oliver, the dashing Matt Bloch. The eyes of Orlando are set on Rosalind, daughter of the banished Duke Senior. Rosalind is carried with intelligence, wit, and girlish charm by Rebecca Turner; her transformation from Rosalind and Ganymede, her new male persona while in the forest of Arden, is not awkward, outrageous, or unamusing. Turner’s perfect amount of poise and scrambling improvisation as Ganymede produced many laughs. Celia, played by Jocelyn Honoré, joins her banished cousin Rosalind in an act of sisterly solidarity; this theme runs strongly between the two throughout the show, even coming down to the adoption of new identities: the boyish Ganymede for Rosalind and his companion Aliena, Celia’s new pseudonym. Traveling through the forest of Arden, they come across some interesting characters such as the simple country girl Audrey, played by Taylor Lynn Dawson, and Corin, the old shepherd, played by Bill Blair. The level of comedy in this production needs to be clear cut, and thankfully this cast delivers. 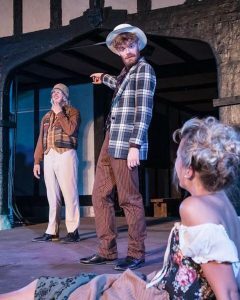 The classic character of the fool, Touchstone, is given a more heightened air, yet still comes with a side order of wit and physical comedy thanks to the talent of John Mincks. Luke Schares conveys the melancholy Jaques a dark comedic bite with sprinkles of play on words and utterly perfect timing. Although it contains many funny moments, As You Like It has its scenes that are crucial to the plot yet do not contain the same amount of laughs as other scenes. Because of that, it is up to the director and his cast to keep the life within these scenes. In places like this, the energy dragged, leaving many spaces unfilled and losing the interest of the audience. Actors seemed to be awkwardly placed and forced to add jokes on the spot to fill the air. It almost came as a relief when the alternating comedic scenes would follow. 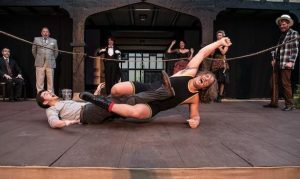 Compared to Shakespeare’s other plays, As You Like It does not contain many throwaway scenes; however, the need to keep up pace in these instances is key. To save from the energy withdrawal, one very noteworthy supporting character was that of Phoebe, played by the energetic and versatile Nicole Morris-Anastasi. Phoebe, a shepherdess who falls in love with Ganymede (not knowing it’s actually Rosalind in drag), is often portrayed as just an innocent comedic relief to add to the confusion of Rosalind’s hidden identity in addition to the third and final leg of the love triangle between her, Rosalind, and Orlando (who does not know Ganymede is really Rosalind). The character of Phoebe is often not given the depth or intelligence she actually possesses, but Morris-Anastasi properly accentuates the three dimensional aspects of Phoebe. When receiving her quips from the uninterested Ganymede, she breaks down her insults and observations in a detailed fashion, exemplifying her brain–and obsession with her new love interest. The hopelessly love-struck shepherd, Silvius (the adorable Cooper Sved), takes Phoebe’s nasty remarks as notions of romance, tongue lolling as she passes him by. 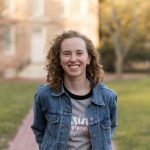 It was a relief to see Phoebe be given such dimension and thought, as well as a new level of comedy with her lisp and dorkish affect. It is also worth noting that visually, the show peaks because of its costumes. Cora Delbridge did a great job capturing the mid-century French couture mixed with the forest wear of the banished Duke Senior and his band of men. As You Like It delivers on its laughs, its romance, and its heart. One can sense the amount of love the cast members have for one another, and it shows in their delivery. It is just another delicious addition to the magic that happens at Agecroft Hall. 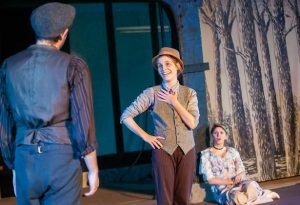 As You Like It continues through July 29th, and tickets can be found here.